The understanding of the nature of floral change across the K-T boundary has been delayed both by the nature of the plant fossil record and by poor temporal resolution in Cretaceous nonmarine rocks. The rapid rise of angiosperms in the Early Cretaceous and the rarity of thick, continuously fossiliferous, Cretaceous sections further complicated this situation. Angiosperms dominate modern vegetation and account for more than 80% of living species, but they appeared abruptly in the fossil record over a span of 25 million years in the Early Cretaceous. Early Cretaceous angiosperm leaves are superficially similar to living ones, and this similarity gave rise to the misconception that extant angiosperm genera first appeared in the Early Cretaceous. This sudden appearance, known as Darwin's abominable mystery, set the stage for several misconceptions and stratigraphic problems. Moreover, paleobotany has traditionally been summarized at the stage level and no great stock has been placed in obtaining the precise age of fossil floras. Before the Alvarez challenge, it was considered sufficient to state that a flora was Cenomanian or Campanian, or perhaps late Cenomanian or early Campanian. These stages are 6.1 and 12.9 million years in duration, respectively, and clearly represent too long of a time bin to be relevant to resolving change over short periods of time. Despite the fact that stages are too long to record rapid events, the nature of the terrestrial fossil record is such that even placing floras into a stage can be challenging when there is no direct correlation to marine strata. This situation has largely been resolved for Upper Cretaceous terrestrial rocks in the Rocky Mountain region of North America, but in other areas of the world paleobotany is still operating at the stage level of resolution and there are many regions where even stage-level resolution has not been achieved. In the early days of paleobotany in Europe, this situation was complicated by the predominance of marine strata and the resulting discontinuity of the terrestrial Cretaceous rock record and the paucity of Upper Cretaceous and Paleogene plant-bearing beds. Whereas the marine invertebrate record of Europe showed a clear break at the K-T boundary with the distinct disappearance of ammonites and inoceramid bivalves, there were neither the terrestrial facies nor the fossils to track the history of plants over the same time period. The plant-bearing, Lower Cretaceous Wealden Group in the south of England contains no angiosperms. 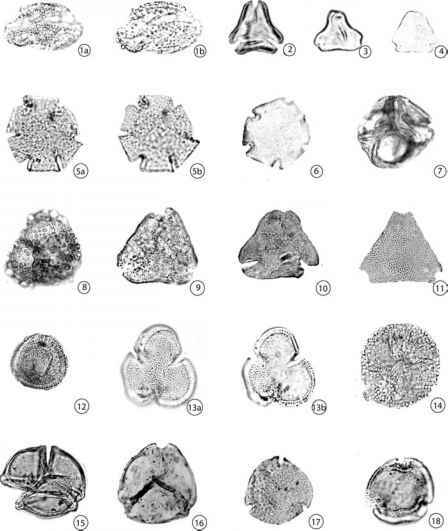 The most extensive Cretaceous angiosperm-bearing units in Europe, those in the Czech Republic, are Cenomanian, or roughly 30 million years older than the K-T boundary, but they contain abundant angio-sperms and thus superficially appeared to have a modern aspect. The paleobo-tanist Oswald Heer made a practice of calling most angiosperm-dominated floras "Miocene" in a direct reference to their modern appearance. Similarly, Paleocene floras are also rare in Europe with only isolated sites near Gelendin in Belgium, Sezanne east of Paris, and the intertrappean deposits of the Isle of Mull in Scotland. Thus, the European record is markedly discontinuous and spotty on one hand and the early observers had not tuned their vision to distinguish between Cretaceous and Paleocene floras on the other. In fact, the Paleocene as an epoch, though defined in 1874, was not widely accepted until the 1950s (Mangin 1957). In general, terrestrial sections can be relatively expanded compared with marine sections, yet individual exposures are rarely extremely thick, so the amount of time represented by any section is often relatively short. In the Rocky Mountain region, typical terrestrial sediment accumulation rates are about 100 m/my and exposures are typically tens to hundreds of meters thick. Thus, it is rare to find consecutive stages in superposition and fossil sites were usually discovered and studied in isolation from each other. For this reason, it was difficult to understand the temporal succession of fossil floras in advance of regional syntheses. Such an opportunity was missed by Oswald Heer, who described dozens of floras that were discovered by Arctic explorers on Svalbard, Iceland, Greenland, and Alaska. The lack of vegetation cover over some of these sections presents more outcrop continuity than is found in the more vegetated lower latitudes. In his eight-volume Flora Fossilis Arctica, Heer described hundreds of leaf taxa from Cretaceous to Miocene strata. Unfortunately, very little stratigraphic information was retrieved and a golden opportunity to understand the succession of Arctic floras was delayed for more than a century. Some of Heer's collections from the NUgssuaq Peninsula near Disko Island on west Greenland actually span the K-T boundary (Heer 1882,1883; Koch 1964). A clear understanding of the distribution of angiosperm-dominated floras relative to the K-T boundary did not begin until the exploration of the large sections of North America. Early work on the Albian-Cenomanian sequence exposed along the Atlantic coastal plain from New York to Virginia showed a sequence of floras that were admixed with bennettites, ferns, and conifers (Hickey and Doyle 1977). These rocks had similarities to the Wealden flora but they also contained angiosperms. A similar succession of rocks in the Black Hills of South Dakota included the transition from gymnosperm-pteridophyte floras in the Lakota Formation to ones dominated by angiosperms in the Dakota Sandstone (Ward 1899). Whereas exposures in the Atlantic coastal plain were heavily covered with vegetation and difficult to map, the sections in South Dakota were part of an extensive and easily mapped sequence that was continuous up through the Paleocene portion of the section. Lester Ward, Leo Lesquereux, and John Strong Newberry were quick to see that the angiosperm floras of the Dakota Sandstone were overlain by thousands of feet of ammonite-and marine-reptile-bearing Cretaceous marine rock and hence they deduced that the angiosperm radiation had occurred before the end of the Cretaceous.